and long-running series including "We're Not Alone." 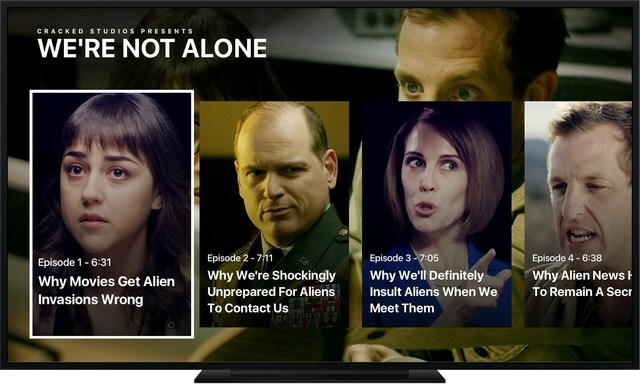 Cracked, the leading digital-media satire brand for millennials, is now available in the Apple TV App Store, giving fans a new way to enjoy social commentary and news through a comedic lens. The Cracked app offers new videos daily and long-running series including Webby Award Winner "After Hours," "Honest Ads" and "We're Not Alone." "Our loyal and tech-savvy fans are already on the Apple TV platform, and as we expand our OTT footprint, we believe it is important to convert new audiences to our brand," Mandy Ng Rusin, vice president and general manager of Cracked, said. "Millennials love having the freedom to choose their programming and now they can enjoy all of our smart and funny content on the big screen for an even more powerful experience." Cracked has earned a loyal following with its original, award-winning video content. It has more than 1.4 million subscribers to its YouTube channel and is tracking tremendous audience engagement on other OTT platforms including Roku, Pluto TV and Xumo. On OTT, its viewers spend an average of one hour watching Cracked content. That type of engagement is appealing to advertisers who want to connect with targeted consumers. To access Cracked on Apple TV, just add the Cracked app from the Apple TV App Store. Cracked is a wholly owned subsidiary of The E.W. Scripps Company (NYSE: SSP). Scripps already has built a significant presence on all the major over-the-top and Internet-delivered video platforms with its millennial-focused national news brand, Newsy. "We are leveraging the strong relationships we have created between Newsy and big OTT service providers to build Cracked as a successful OTT brand as well," Adam Symson, Scripps chief operating officer, said. "Newsy appears on 16 OTT platforms, and its reach and traction have helped us create meaningful partnerships with OTT providers looking for more great content that's appealing to an OTT audience."